Festivities today are both about the mood and the family, and above all about saving some money and making gifts that you can give to others, including your children. There are so many festive and funny ideas for DIY Easter gifts that buzz around the web. As Easter approaches, we thought you might find some of our favorites inspiring. Most tutorials are quick and easy to follow. In addition, all gift ideas are colorful and will add a lot to the good mood on this special day. Instead of buying a ton of Easter sweets or chocolates to fill the Easter baskets, you can make some fancy DIY Easter gifts. That’s why we share some great ideas with you. Many of them are also suitable for adults. Check out these 10 DIY Easter gifts so you can save both time and money as you celebrate a unique Easter this year. Draw a square on the fabric using the ruler and the marking pen measuring 20 x 20 centimeters. 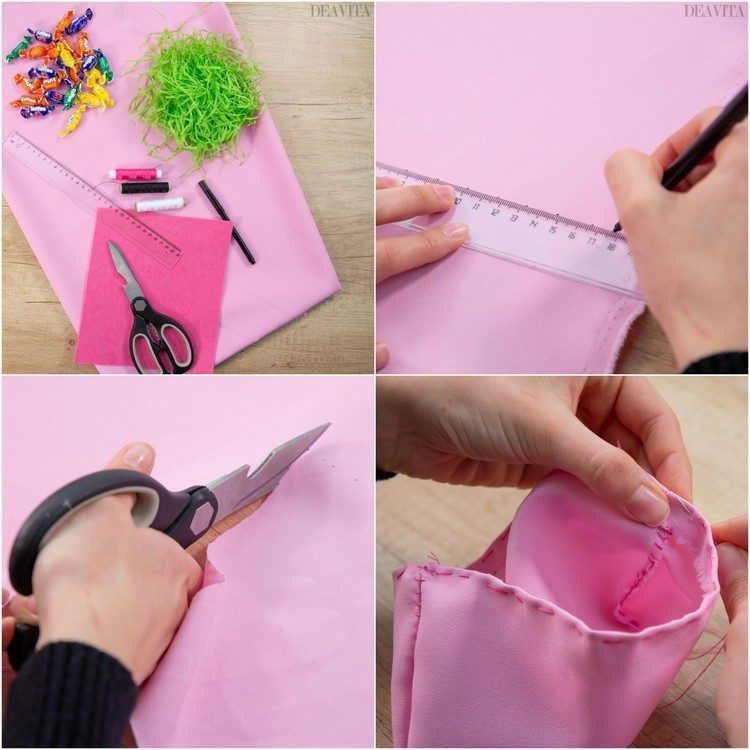 Cut out the shape and then sew the two sides together to make a bag. Leave 1 cm on both sides to allow room for a hem. Turn the bunny bag over and make a hem at the top. Contour the eyes, nose and mouth with the pen that you will embroider afterwards. Draw bunny ears on the felt, the inside of which you embroider with the white thread. 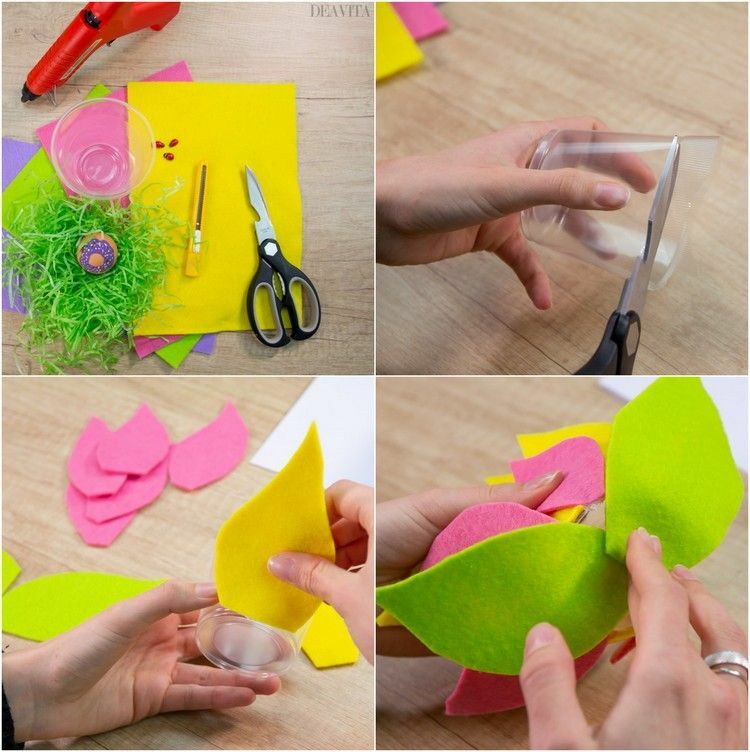 Sew the rabbit ears from both sides inside and then decorate with the paper grass. 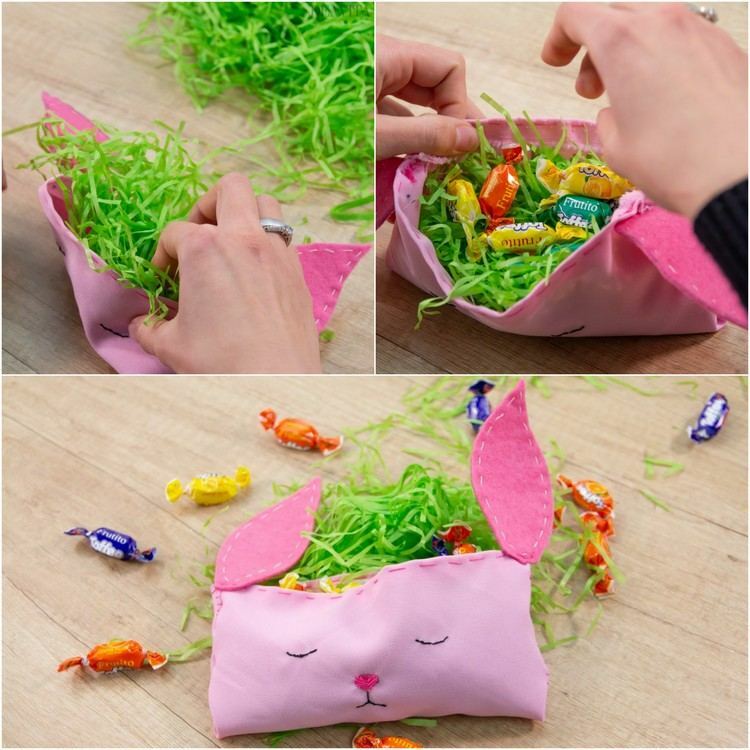 Fill the bunny bag with sweets or treats. 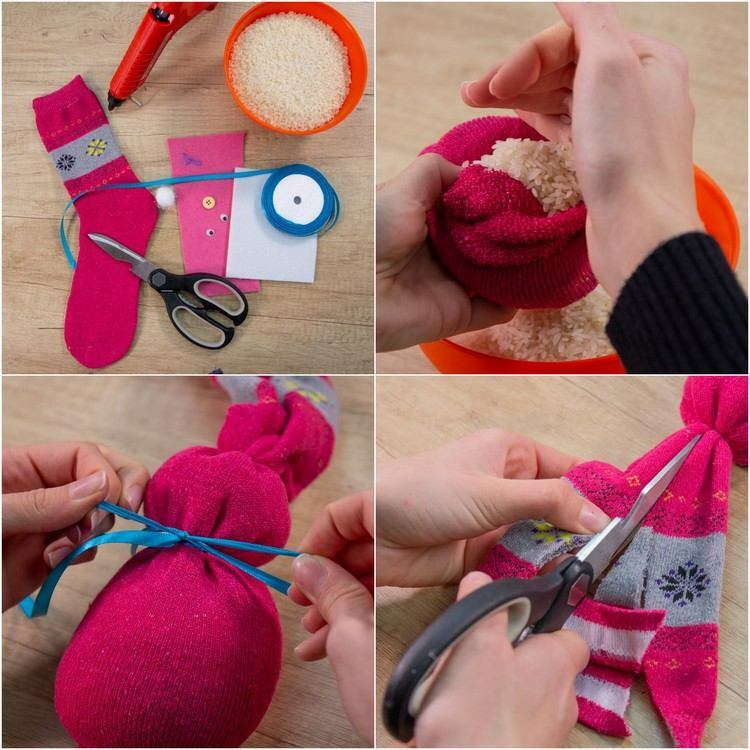 Fill one-third of the sock with rice and then tie it with a rubber band. Fill the top of the sock with more rice to shape the Easter bunny’s head. This should be about half the size of the body. Tie with a rubber band as well. Cut the top of the sock in half to create ears on the sock bunny. 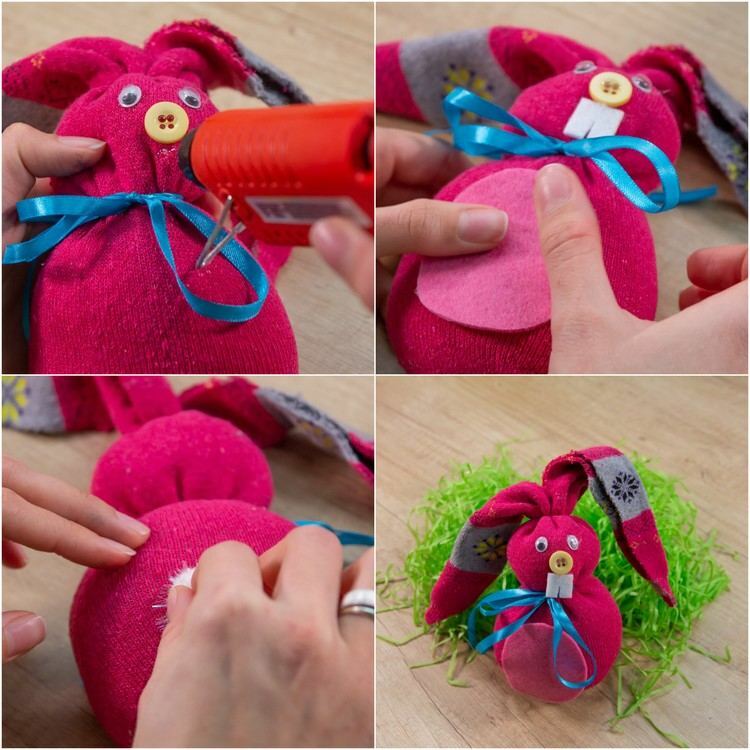 Glue the moveable eyes and the button as a nose with the hot glue gun on the face of the sock rabbit. Cut a tiny square piece of felt cut down the middle that resembles teeth and glue it to the sock. Cut a circular piece from the pink felt, this will be the tummy of the bunny, and glue it with hot glue. Attach the pom-pom to the back of the bunny. 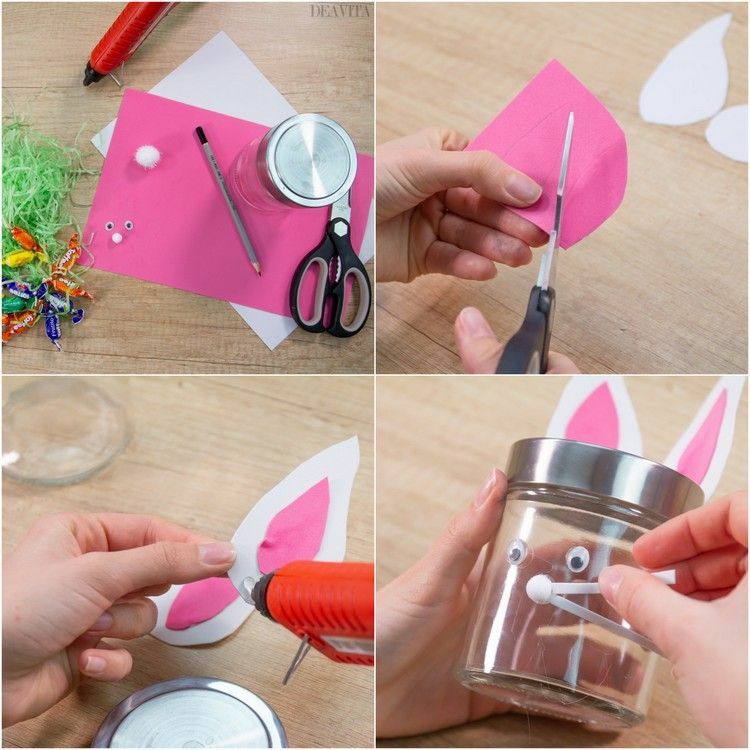 Draw two bunny ears on the white foam with the pencil and then cut them out. The small, inner parts of the ears can be crafted from the pink foam. 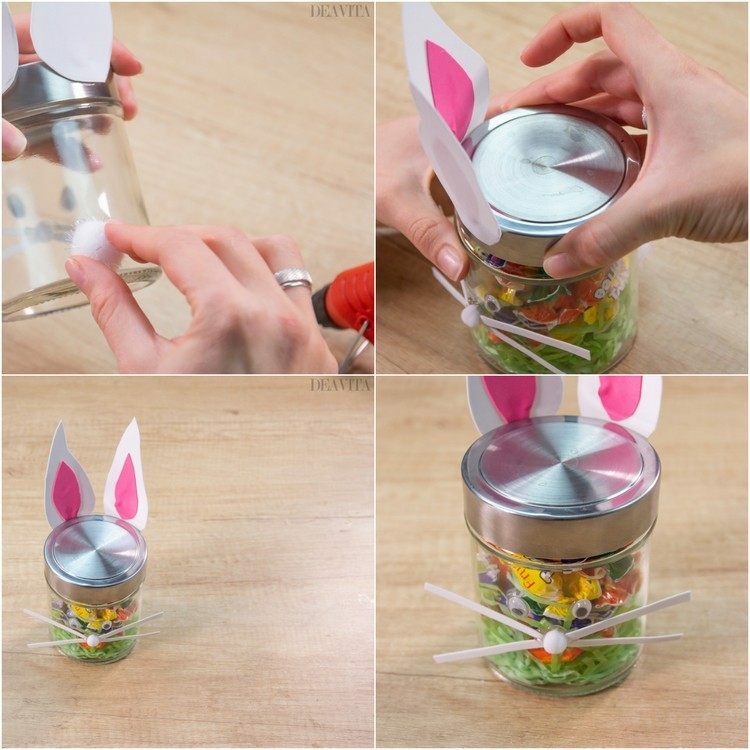 Glue the finished bunny ears on the glass lid. Attach the moveable eyes on the glass with hot glue, and under these the small pom pom as a nose. Cut 4 strips from the white foam and glue two of them on each side of the nose. 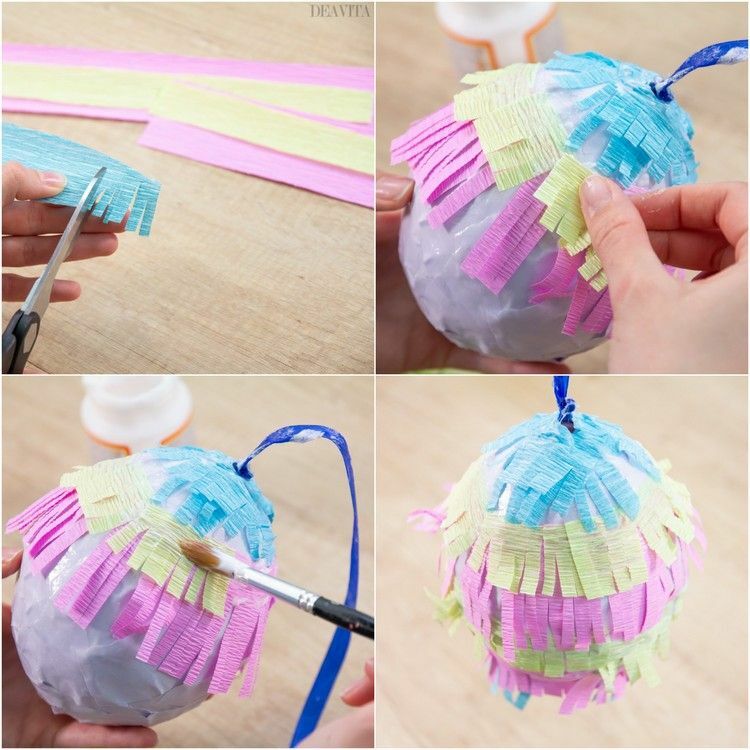 Glue the big pom pom on the lower back of the glass for the tail. Fill the jar with paper grass and confectionery. Draw a triangle in the shape of a carrot, which you then cut out and use as a template for another triangle. Attach strips of double-sided tape to the insides of one piece of paper and then glue the other on top. Fill the carrot bag with sweets. 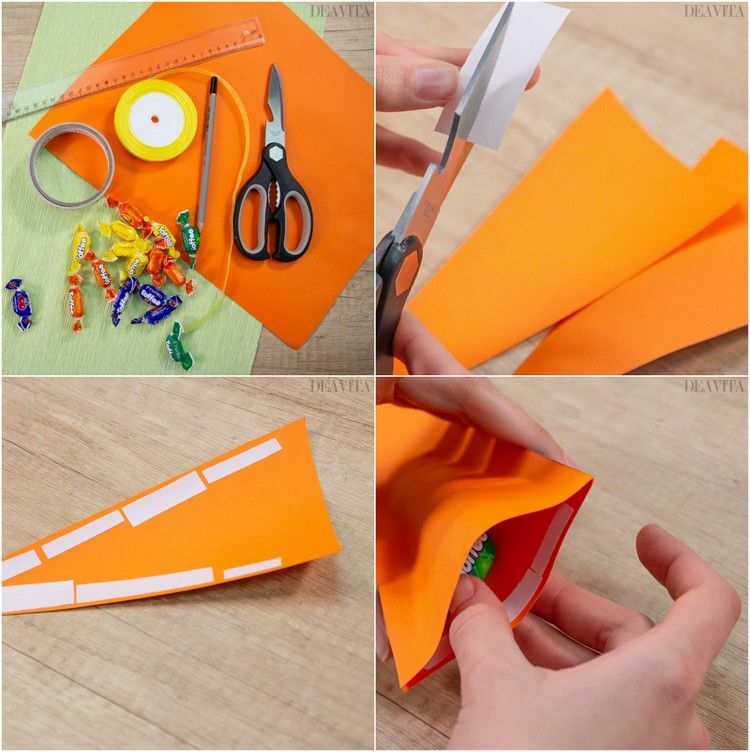 Cut a piece of crepe paper into fringes, attach them to the top of the carrot with double-sided tape and close the opening. 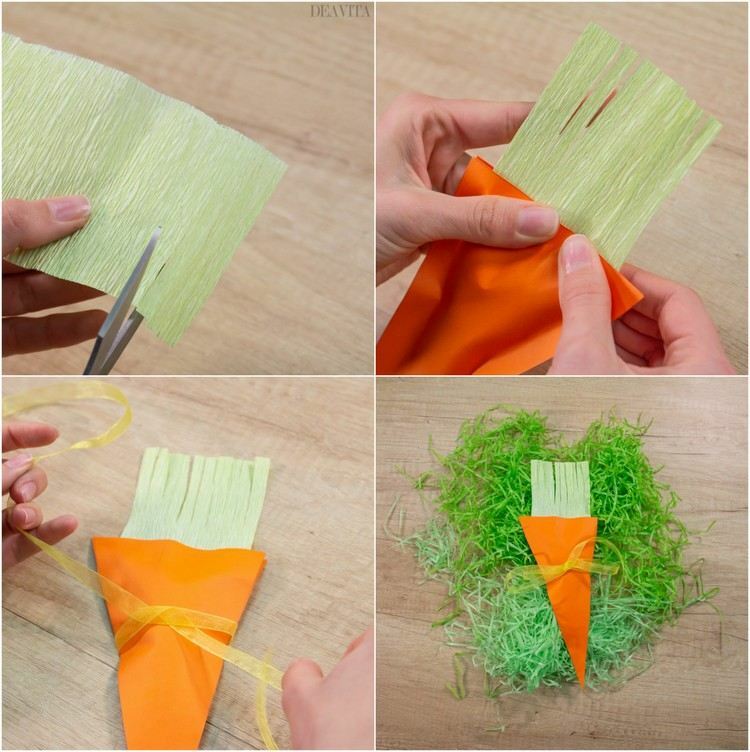 Decorate the carrot bag with a bow. 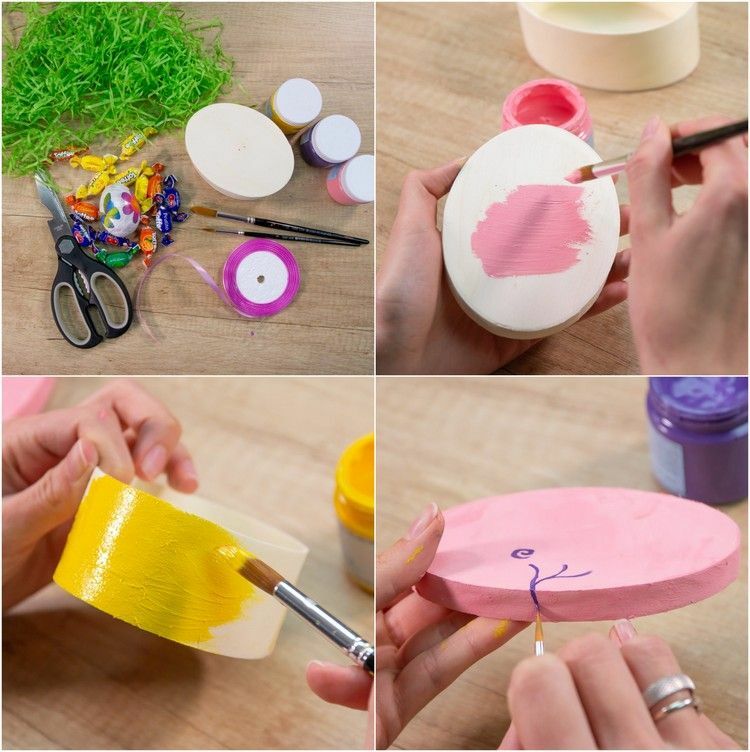 Paint the lid of the box in any color (pink, for example). Repeat the process for the box with yellow acrylic paint. You can draw purple motifs and yellow flowers on the lid. Let it dry. Fill the box with paper grass and then add the egg and confectionery. Put the candle on the crepe paper and gather the ends. 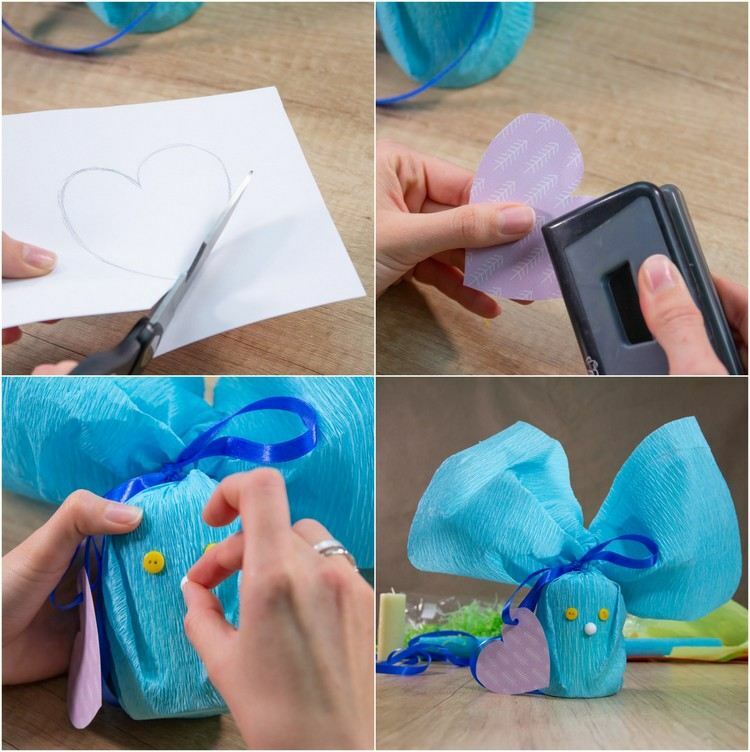 Draw a heart on the back of the paper, cut it out and punch a hole for the ribbon. Glue the two buttons as eyes and the little pom-pom as nose. Use the big pompom for the tail. Paint the wooden box with any color and glue a straw in each corner. 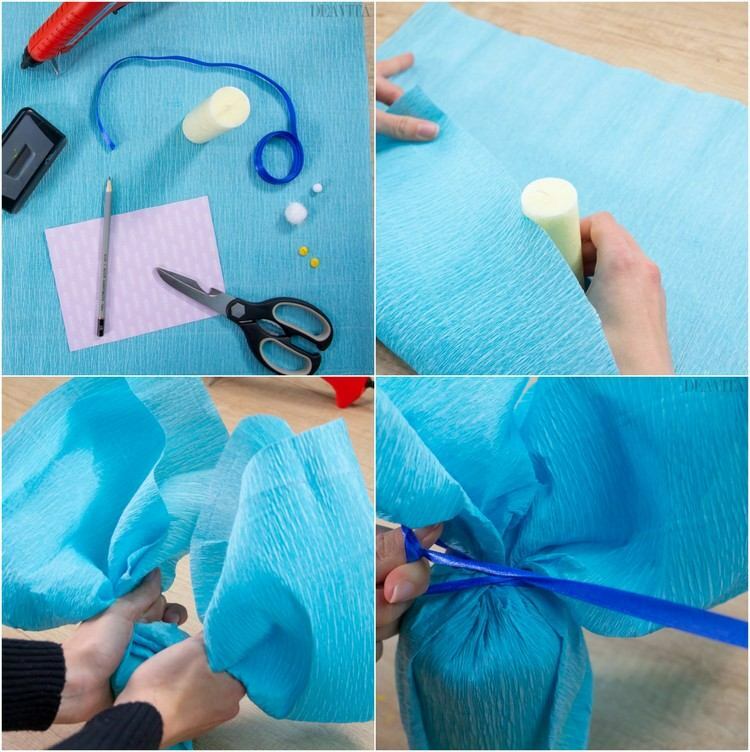 Inflate the balloon and fix a small piece of tape on top of each straw. 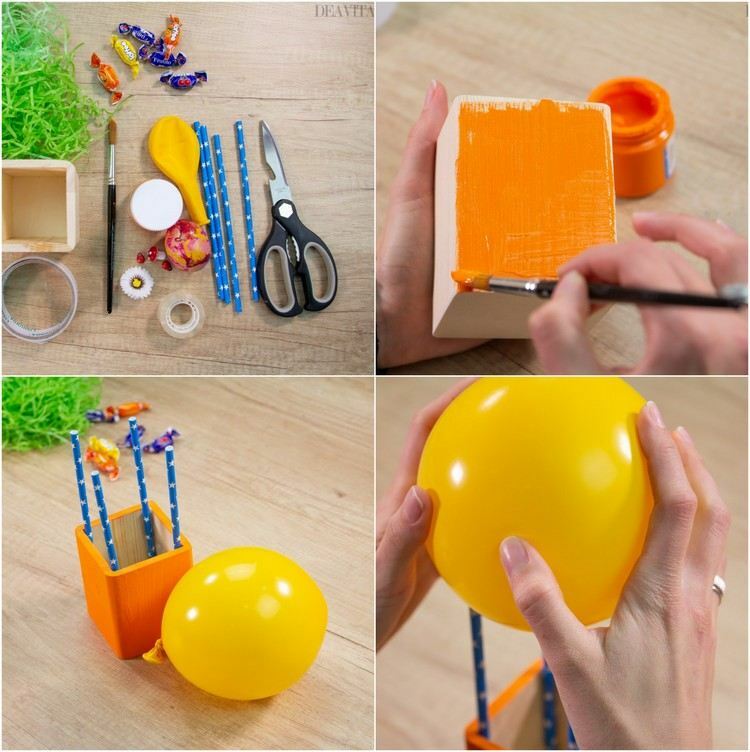 Position the balloon so you can attach it to the straws. 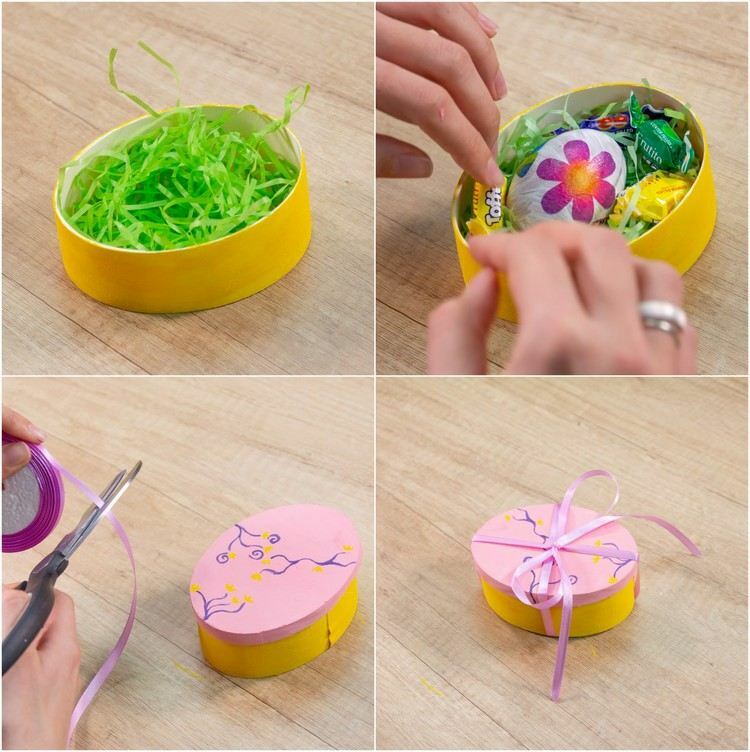 Fill the box with paper grass, Easter egg, sweets and decorations. In addition, you can attach two ladybugs using the double-sided adhesive tape. Cut about half of the cup through the middle. 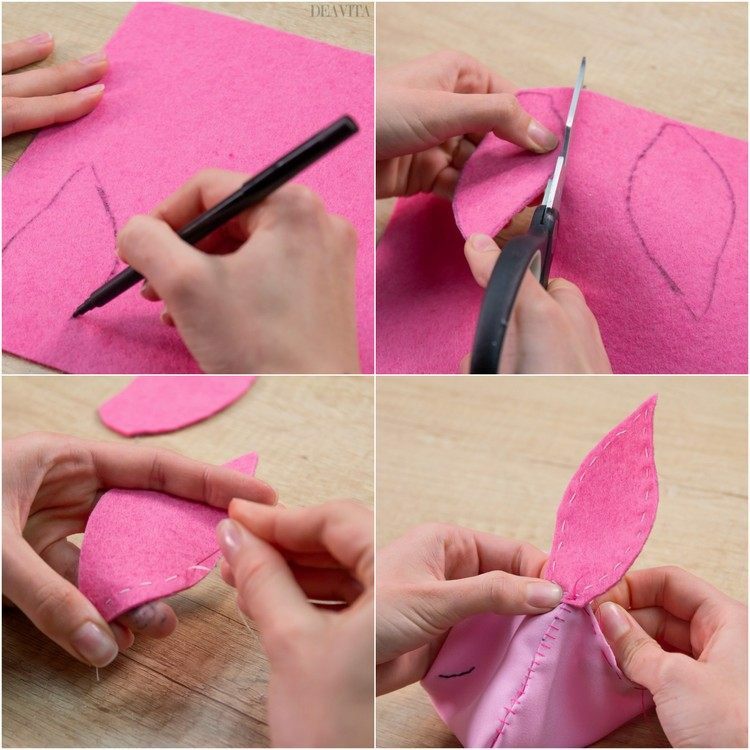 Draw 5 yellow, pink and 2 green leaves on the felt, then cut them out. Cut a strip from the purple-colored felt that will be the handle of the Easter basket. Fill the gift basket with paper grass and Easter egg. Inflate the balloon and tie it to the band. 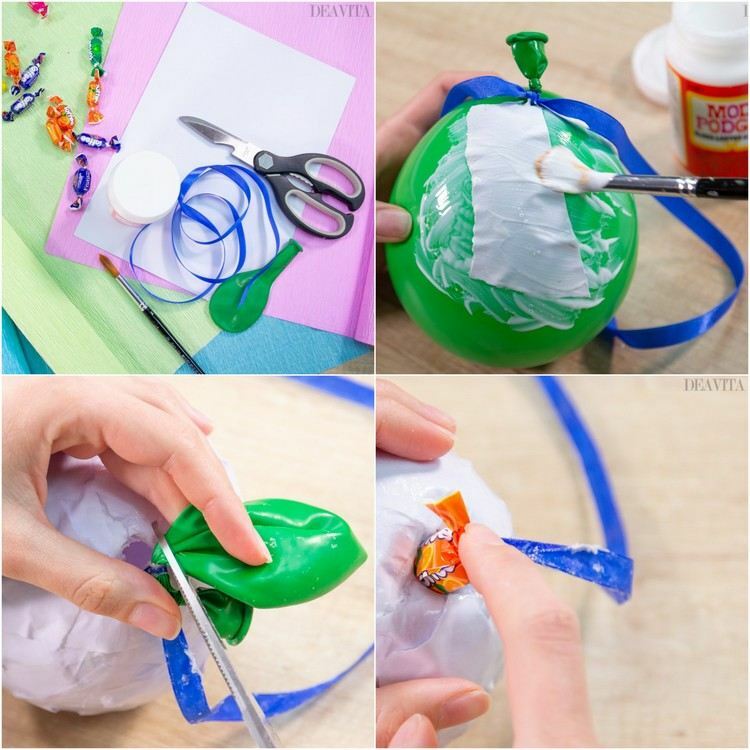 Tear small pieces of paper and apply craft glue on the whole balloon to glue the paper strips. Add a second layer of glue. Let it dry for 12-24 hours. After drying, make a small hole, pinch the balloon and remove it. 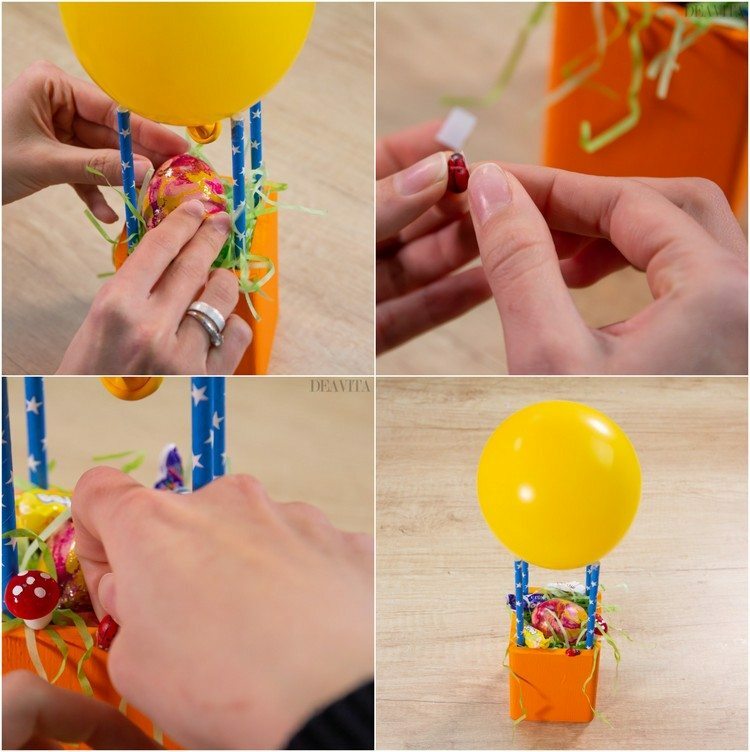 Use the same hole to fill the egg shell with sweets or other small treats. Cut 5-6 strips of different widths from the crepe paper and make fringes. 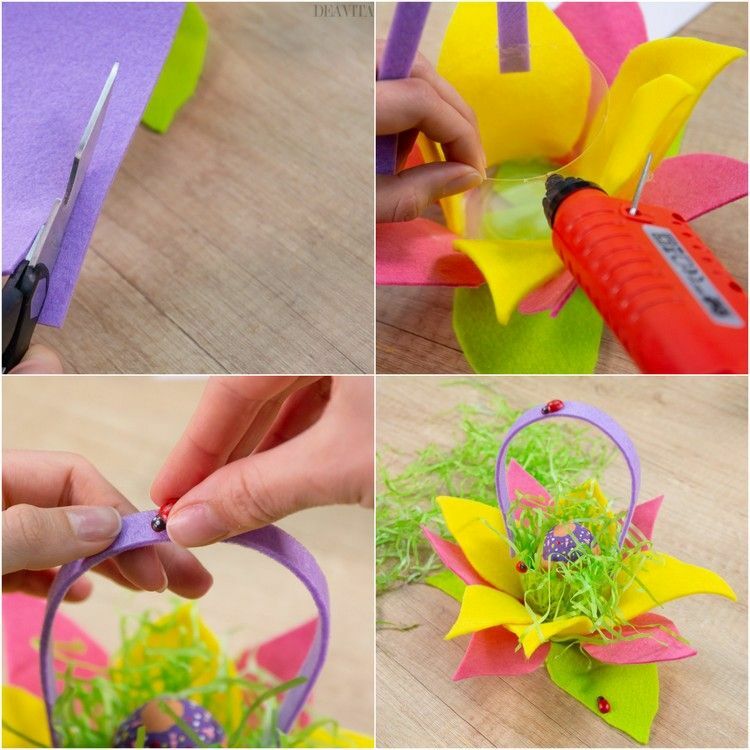 Cover the Easter egg with craft glue again and glue the crepe paper. Use the bow compass to draw two 5 cm circles and two 3 cm diameter circles on the paper. 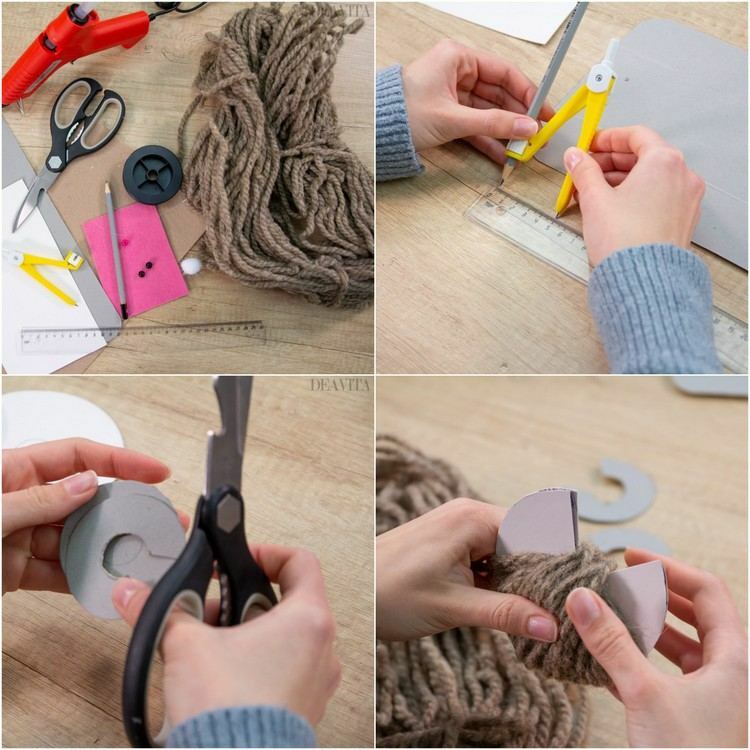 In the center of each circle, draw smaller circles of 1 cm in diameter and then cut them all out as in the photos, so you can wrap the yarn. 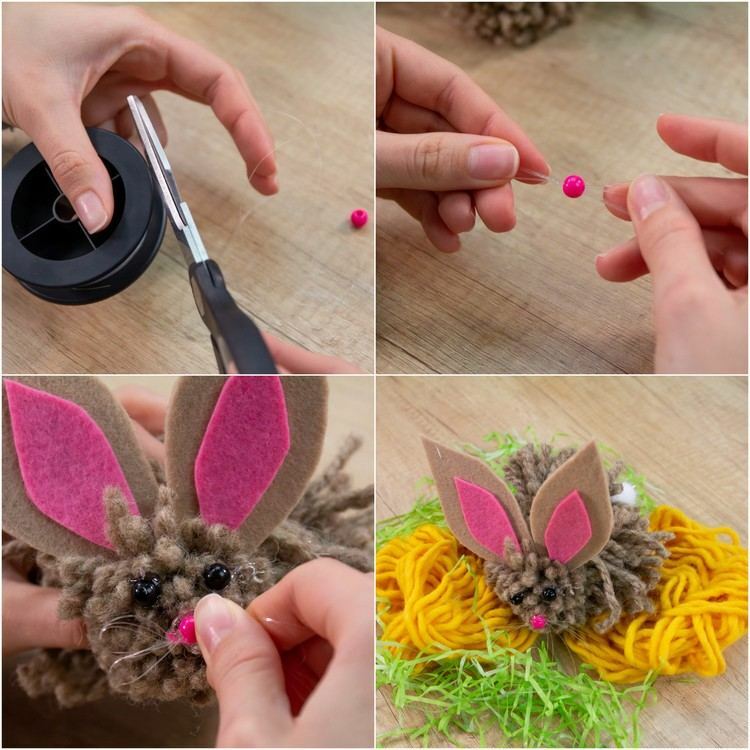 The finished pom-poms are then tied together so that they form the head and body of an Easter bunny. Cut out 2 bunny ears from the brown felt and 2 smaller pieces from the pink felt fabric. 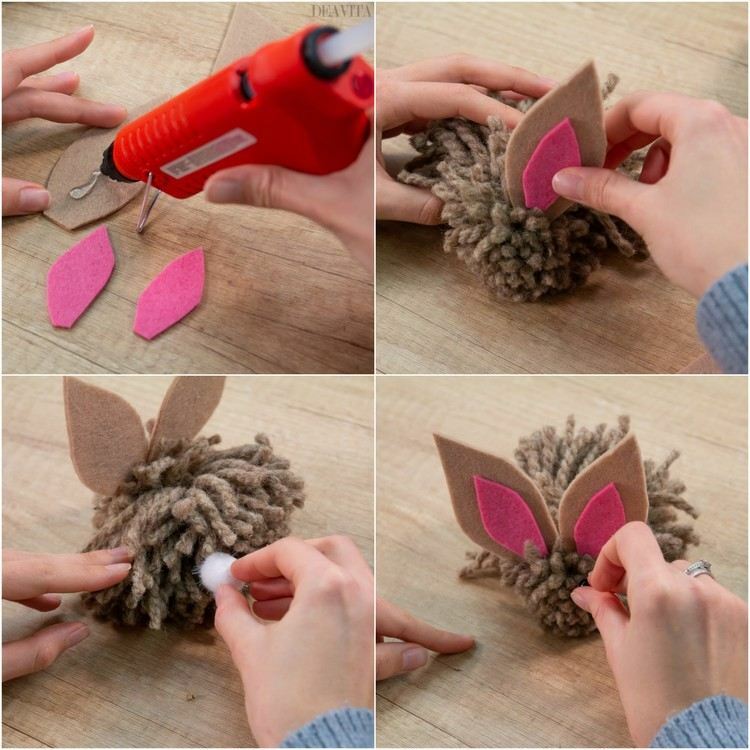 Glue the smaller pieces of felt onto the larger ones and then glue the ears on the bunny head with the hot glue. Glue a pompom on the back as a tail. Use black beads for the eyes. Use the fishing line and the pink pearl to make the whiskers and glue them with hot glue gun. 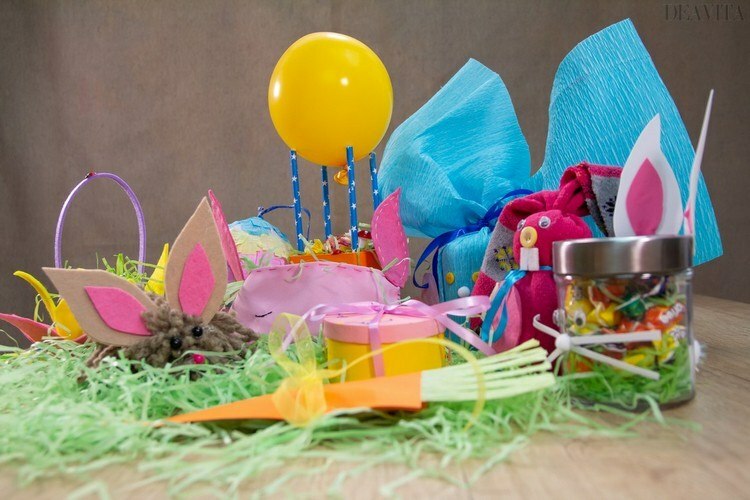 The post 10 DIY Easter gifts – cute and funny ideas for a great Easter appeared first on Deavita Interior design and Architecture Magazine.